Model: RB3016 W0365 Clubmaster. There is a laser "RB" Logo on one lens, and a printed "Ray.Ban" Logo on the other lens. RAY-BAN SUNGLASSES. Lens Color: Green Classic G-15. Size Lens - Bridge: 51mm - 21mm. Model number: RB2140. Style: Original Wayfarer Classics. Lenses: Polarized Green Classic G-15. Color and size of case may vary due to manufacturer changes. Shape: Square. (1) RAY-BAN Case. UPC: 805289126591. Model #: RB3025 L0205. Includes: Sunglasses, Case, Microfiber Cloth, Booklet (Just as pictured-Case Color May Vary! ). Lens Color: Green Classic G-15. I will not be held responsible for any issues thereafter. Model #: RB3025 001/3F. Lens Color: Light Blue Gradient. Includes: Sunglasses, Case, Microfiber Cloth, Booklet (Just as pictured-Case Color May Vary! ). I will not be held responsible for any issues thereafter. Ray-Ban RB2027 Predator 2 sunglasses take on the traditional Recatncle Sunglasses design with a Ray-Ban signature logo that is displayed on the thin temples. Ray-Ban Predator 2 sunglasses. Silver Ray-Ban logo embedded in the temple. Lens Technology : Gradient Polarized. And with over 350 sunglasses inspired by the latest fashion trends, there’s a pair for everyone. With over 1000 sunglasses inspired by the latest fashion trends, there’s a pair for everyone. 100% CUSTOMER SATISFACTION GUARANTEED PLEASE VISIT OUR PAGE TO SEE ALL OUR AVAILABLE LISTINGS FOR MORE OPTIONS Brand new 100% authentic Ray-Ban Predator sunglasses Havana brown frame, Classic Brown B-15 lens. Hand made in Italy. COMES WITH EVERYTHING SHOWN IN IMAGES ABOVE INCLUDING SUNGLASSES:Box, Ray-Ban Medium size black case, Cleaning cloth and Ray-Ban booklet. (ITEM IS 100% BRAND NEW) ITEM DETAILS: MODEL NUMBER: RB 4033 COLOR CODE: 642/47 LENS COLOR: B-15 BROWN, TORTOISE BROWN FRAME SIZES: 60mm eyesize, 17mm Bridge length, 130mm temple length. Made in Italy Returns accepts item must be in same condition as sent brand new, also must come with everything for refund. Thank you for understanding. Model: Standard 50mm : RB2140. 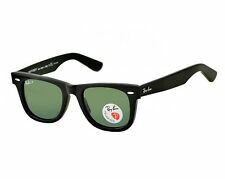 Ray-Ban Original Wayfarer Classics are the most recognizable style in the history of sunglasses. Since its initial design in 1952, Wayfarer Classics gained popularity among celebrities, musicians, artists and those with an impeccable fashion sense. ~ Ray-Ban Justin sunglasses may just be one of the coolest looks in the Ray-Ban collection. Justin RB4165 sunglasses are bold, fun and unforgettable. ~ Model: RB4165 601/8G. ~ Lens Size: 54mm. ~ Lens Color: Grey Gradient. These larger sunglasses flatter most face shapes. CASE | CLEANING CLOTH | BOOKLETS | WARRANTY. ~ Model: RB3025 L0205. ~ Currently one of the most iconic sunglass models in the world, Ray-Ban Aviator Classic sunglasses were originally designed for U.S. aviators in 1937. ~ Lens Size: 58mm. ~ Style: Aviator. 5 out of 5 stars - Ray Ban Aviator Sunglasses RB3025 L0205 58mm Arista Gold Frame/Green Classic!! 22 product ratings22 product ratings - Ray Ban Aviator Sunglasses RB3025 L0205 58mm Arista Gold Frame/Green Classic!! Model #: RB3025 112/Z2. Includes: Sunglasses, Case, Microfiber Cloth, Booklet (Just as pictured- Case Color May Vary!). Lens Color: Copper Pink Mirror Flash. I will not be held responsible for any issues thereafter. Model #: RB3025 112/17. Includes: Sunglasses, Case, Microfiber Cloth, Booklet (Just as pictured-Case Color may Vary! ). Lens Color: Blue Flash Mirror. I will not be held responsible for any issues thereafter. Great price for polarized sunglasses. • Sizes: 60mm eyesize, 17mm Bridge length, Temple length 130mm. • Color code: 014/57. RAY-BAN SUNGLASSES. · No other parts, components or accessories. Light Havana. Temple Length Lens Size. ~ Model: RB3025 002/58. ~ Currently one of the most iconic sunglass models in the world, Ray-Ban Aviator Classic sunglasses were originally designed for U.S. aviators in 1937. ~ Lens Size: 58mm. ~ Lens Technology: Polarized. 5 out of 5 stars - Ray-Ban Aviator Sunglasses Polarized RB3025 002/58 58mm Black Frame/Green lens!! 65 product ratings65 product ratings - Ray-Ban Aviator Sunglasses Polarized RB3025 002/58 58mm Black Frame/Green lens!! Ray-Ban ® RB3478 sunglasses are a sporty, functional design with classic Ray-Ban details. like comfortable plastic temples and resistance enforced hinges for strength. Model Number: RB2132. Style: New Wayfarer. Lenses: Green Classic G-15 Polarized. Color and size of case may vary due to manufacturer changes. The Sunglasses we list are all assembled with UV protection Lenses. ~ Model: RB3025 W3277. ~ Mirror your style with Ray-Ban Aviator Mirror sunglasses. Ray-Ban Aviator Sunglasses were designed in 1937 to protect US military fighters against the high altitude glare. ~ Lens Size: 58mm. 5 out of 5 stars - Ray-Ban Aviator Sunglasses RB3025 W3277 58mm Silver Frame/Silver Mirror Lens!! 2 product ratings2 product ratings - Ray-Ban Aviator Sunglasses RB3025 W3277 58mm Silver Frame/Silver Mirror Lens!! They are in perfect condition. RB & Ferrari logo are etched into left lens and ray ban is printed on right lens to ensure authenticity. ~ Ray-Ban Aviator Gradient sunglasses encompass the teardrop shape that started it all. ~ Model: RB3025 001/51. ~ Lens Size: 58mm. ~ Lens Color: Light Brown Gradient. ~ Lens Technology: Gradient. ~ Style: Aviator. 5 out of 5 stars - Ray-Ban Aviator Sunglasses RB3025 001/51 58mm Gold/Light Brown Gradient Lens!! 46 product ratings46 product ratings - Ray-Ban Aviator Sunglasses RB3025 001/51 58mm Gold/Light Brown Gradient Lens!! Trending at $77.98eBay determines this price through a machine learned model of the product's sale prices within the last 90 days. Very crazy, funky Sunglasses! What is all in there?. If you love the Cat Eye look you will love these! If you love Pink Mirrors then these are for you! And the Ray-Ban Logo written in white writing on the left lens. Go back to where it all began with Ray-Ban New Wayfarer Classic sunglasses. Ray-Ban New Wayfarer sunglasses. Silver Ray-Ban logo embedded in the temple. Model: RB3447 112/Z2. Lens Width 50mm. Lenses Color: Pink Flash Mirror. Model #: RB3025 112/19. Includes: Sunglasses, Case, Microfiber Cloth, Booklet (Just as pictured-Case Color May Vary! ). Lens Color: Green Flash Mirror. I will not be held responsible for any issues thereafter. 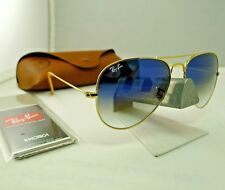 Ray-Ban Aviator RB3025 Unisex. These Shiny Black Sunglasses will give you the sophisticated look you were always looking for. Model Number: RB3025. Ray-Ban RB 3025 Aviator Flash Lenses 019/Z2 Silver/Pink Flash Glass Lens Unisex Sunglasses 58mm. Style: Aviator Flash lenses. Color and size of case may vary due to manufacturer changes. Lens Technology: Polarized. Lens Color: Green G-15. Lens Size: 60 mm. And with over 350 sunglasses inspired by the latest fashion trends, there’s a pair for everyone. With over 1000 sunglasses inspired by the latest fashion trends, there’s a pair for everyone. ~ Reflect your style with Ray-Ban Aviator Flash lens sunglasses, one of the most iconic sunglass models in the world. Wear this Aviator style in a variety of colors such as brown mirror gold, green mirror silver, brown mirror pink and crystal green mirror, to ensure you never go unnoticed. 5 out of 5 stars - Ray-Ban Aviator Sunglasses RB3025 019/Z2 58mm Matte Silver Frame/Copper Pink!! 17 product ratings17 product ratings - Ray-Ban Aviator Sunglasses RB3025 019/Z2 58mm Matte Silver Frame/Copper Pink!! Model Number: RB3447. Color and size of case may vary due to manufacturer changes. The Sunglasses we provided are all assembled with UV protection Lens. There is an engraving "RAY-BAN 5021" Inside the bridge.There is a laser "RB" Logo on one Lens, and a Printed "Ray.Ban" Logo on the other Lens. Summer SALE! It's Time to Ray-Ban RAY-BAN Sunglasses Aviator Mirror Silver Glass Lenses RB3025 W3277 58mm Unisex 100% Genuine High Quality Fast Shipping Description: Model Number: RB3025 Color Number: W3277 Style: Aviator Mirror Frame Material: Metal Frame Color: Silver Lenses: Silver Mirror Lens Width: 58 mm Bridge Width: 14 mm Temple Length: 135 mm Information: All pictures are taken from real product, that means what you see is what you will receive. There is a laser "RB" Logo on one Lens, and a Printed "Ray.Ban" Logo on the other Lens. Ray-Ban sunglasses come with an authentic RAY-BAN case that will keep your glasses safe from kids and daily misfortunes. Color and size of case may vary due to manufacturer changes. Style Number RB2132 902/57. Ray-Ban® New Wayfarer® Classic Sunglasses. Lens: Polarized Natural Brown. All factory labels must be fully intact. Bridge: 18 mm. 100% UV Protection. Model #: RJ 9057S. Authentic Ray-Ban Sunglasses. All our eye-wear is 100% authentic! We strive to. 50 mm 15 mm. When you need. Ray-Ban produces a line of sunglasses and eyewear for men, women, and children. They are known for their vintage Aviator and Wayfarer lines of sunglasses. Since 1937, Ray-Ban has continued to produce luxury sunglasses in a wide variety of classy and affordable styles, and you can find a large variety of these items on eBay. Standard: These lenses were originally developed for the military as Aviator sunglasses. They were the first lenses designed for the Ray-Ban line. Legends collection: This retro line is available in three different vintage colors. This collection was inspired by the self-expression movement of the 1960s. Gradient: These lenses come in a wide range of colors. The gradient lenses transition from a solid color to a transparent shade. They are available in both bi-gradient and mirrored gradient style. Mirror: The mirrored coating helps filter out light and glare. Polarized: These lenses are designed to improve visual clarity, decrease reflection, and reduce eye strain. Ray-Ban sunglasses with polarized lenses will feature a "P" next to the Ray-Ban logo. The lenses are treated with an anti-reflective coating. Prescription: The specialty lenses are created with DST technology for a lightweight HD lens. The HD lenses are designed to increase clarity and provide sharper vision for the wearer. What styles of sunglasses are available? As far as frame colors go, there is plenty to choose from as well. Some of their colors include gunmetal gray, black, gold, tortoiseshell, and bronze. What shapes do these come in? How should these sunglasses be cleaned? The Ray-Ban sunglasses can be cleaned with a lotion-free soap and warm water. You must make sure to thoroughly clean both sides of the lenses and the frames. It is recommended to dry the sunglasses with a lint-free cloth so as to not scratch the lenses. Content provided for informational purposes only. eBay is not affiliated with or endorsed by Ray-Ban.